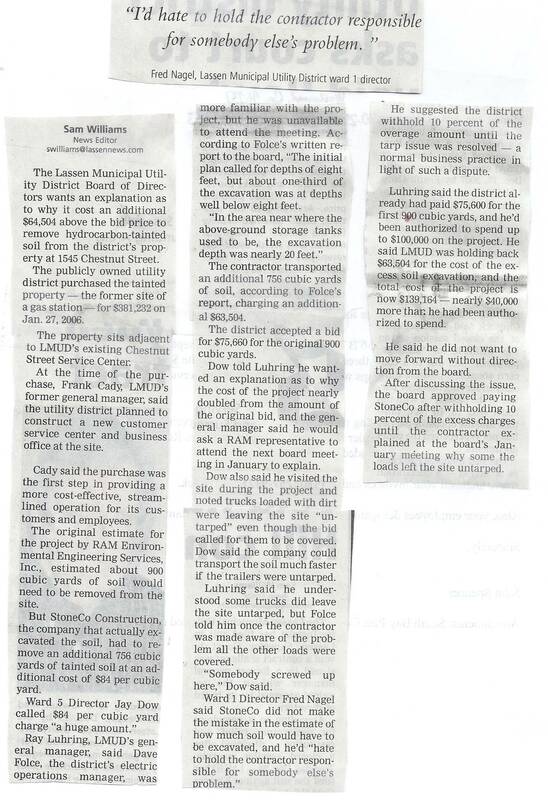 Jaimee Richey/Jones, LMUD President Fred Nagel and Frank Cady negotiated to buy property for LMUD from their friend Jack Beterbide that Beterbide didn't even own. 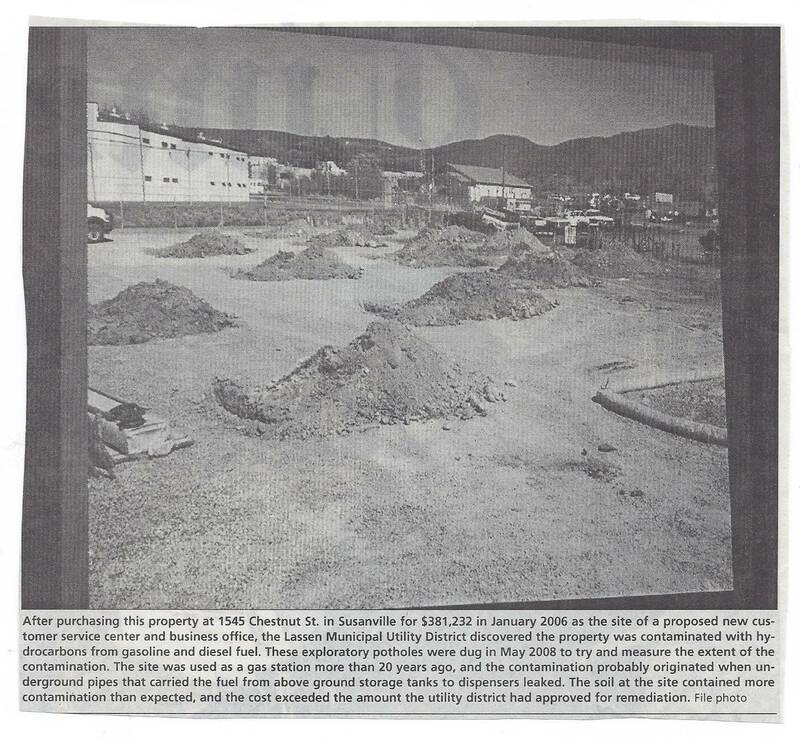 LMUD Board illegally purchased the Beterbide property knowing that it was grossly contaminated and now it is still costing LMUD ratepayers to CLEAN IT UP. 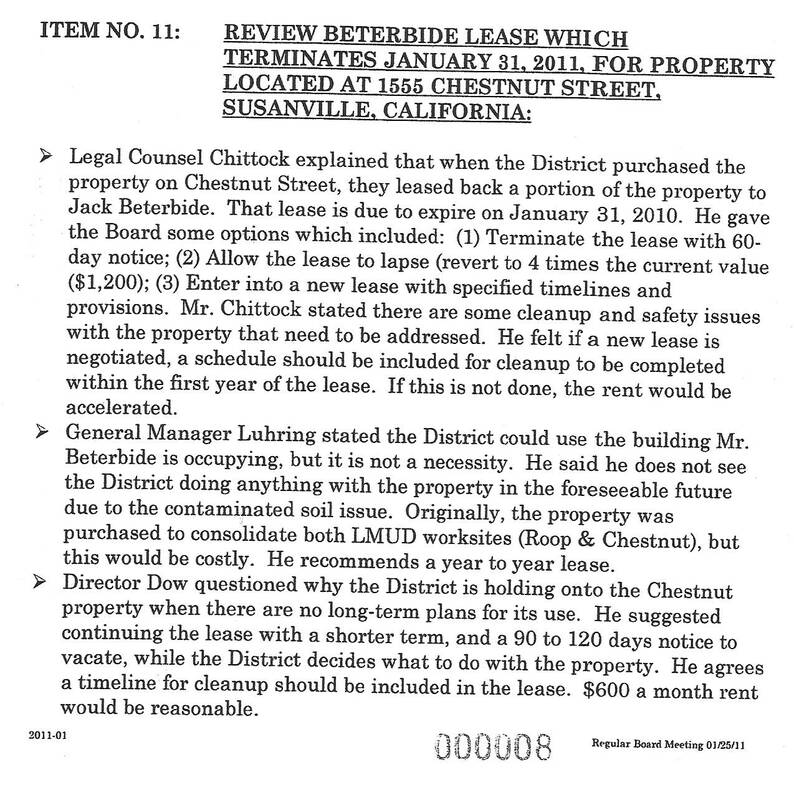 LMUD Board Never took action on the purchase of the Chestnut Avenue Property or Beterbide's Alleged "Lease"
LMUD BOARD COVERS UP HAZARDOUS WASTE BY SECRETLY AND ILLEGALLY PURCHASING THE LAND from Jack Beterbide. 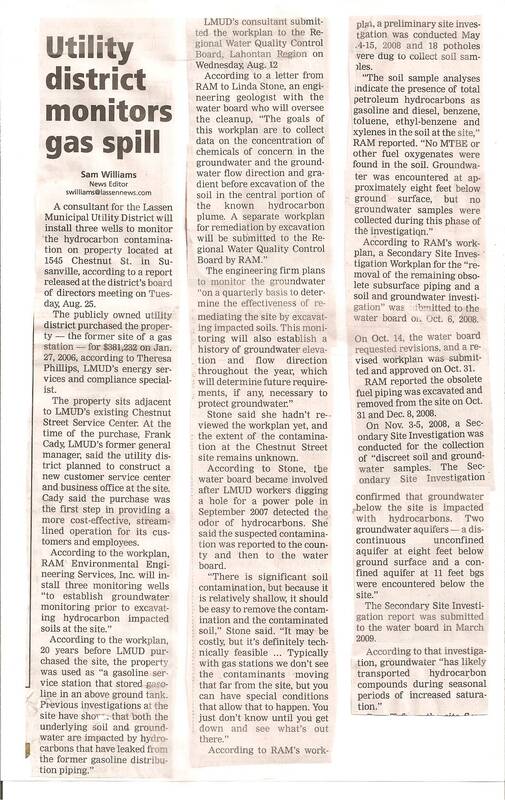 Lassen County Times, finally reports LMUD's PCB spills? Shayla Ashmore was taken to the PCB spills after a LMUD meeting in the fall of 2004. This story, as all stories that exposed the LMUD corruption, was buried. 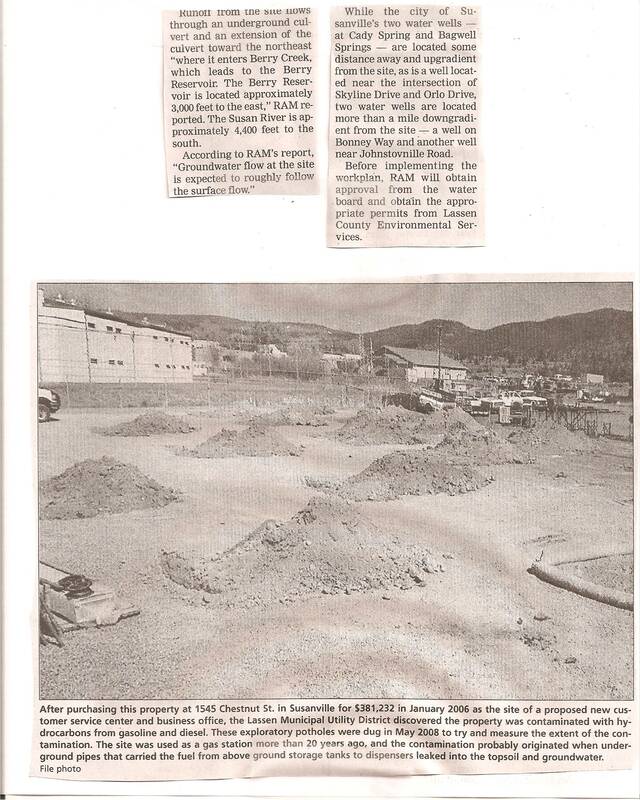 On November 7, 2007, the EPA fined LMUD for falsifying a federal form when they tried to hide the PCB problem. LCT suppressed "this" story also. 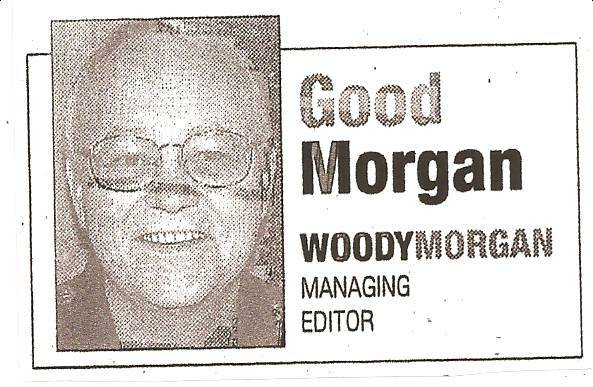 Woody Morgan was Editor of the Lassen County Times in 2004 and was best buddies with Frank Cady and the Nagel clan. The PCB spills, at LMUD, were intentionally suppressed by Woody Morgan. Woody left the newspaper after suffering several strokes. The public never knew about the PCB's until Kan We Help published the story, in March of 2008, after receiving a copy of the EPA fine. *Morgan also suppressed what was actually happening with the Arrowrock Scam and just published what Frank Cady wanted the public to know. When Kan We Help submitted Arrowrock information, Morgan ignored it. The Lassen County Times HAS NEVER PUBLISHED KWH'S SIDE OF ARROWROCK.....................EVER! 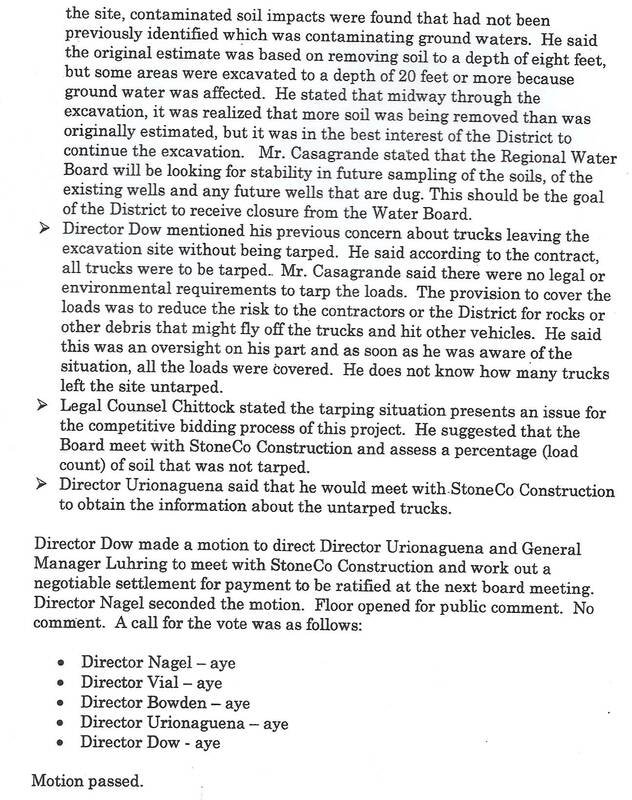 LCT's suppression of the truth about Arrowrock, allowed LMUD to continue this scam for five years. Wayne Langston, Fred Nagel are only LMUD Directors that remain. Both were responsible for the cover-up. Jaimee Richey/Jones, LMUD President Fred Nagel and Frank Cady negotiate to buy property for LMUD from their friend Jack Beterbide that Beterbide didn't own. District Attorney looks the other way.....nothing new there!!! LMUD General Manager and LMUD Board have elected to do the publics business in private. LMUD Agendas will no longer place the public's "business" in open session. 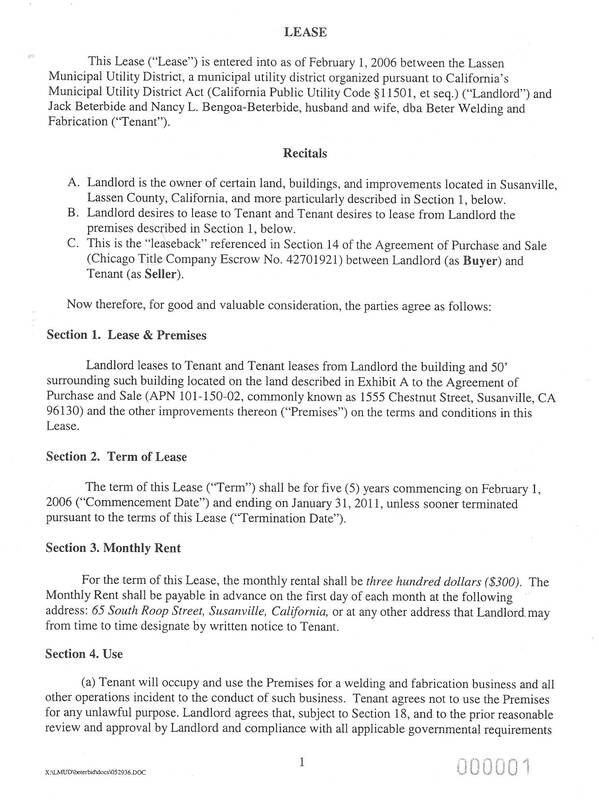 At the November 9, 2005 LMUD meeting, the LMUD Board and Frank Cady placed an item in closed session in regards to "real property. 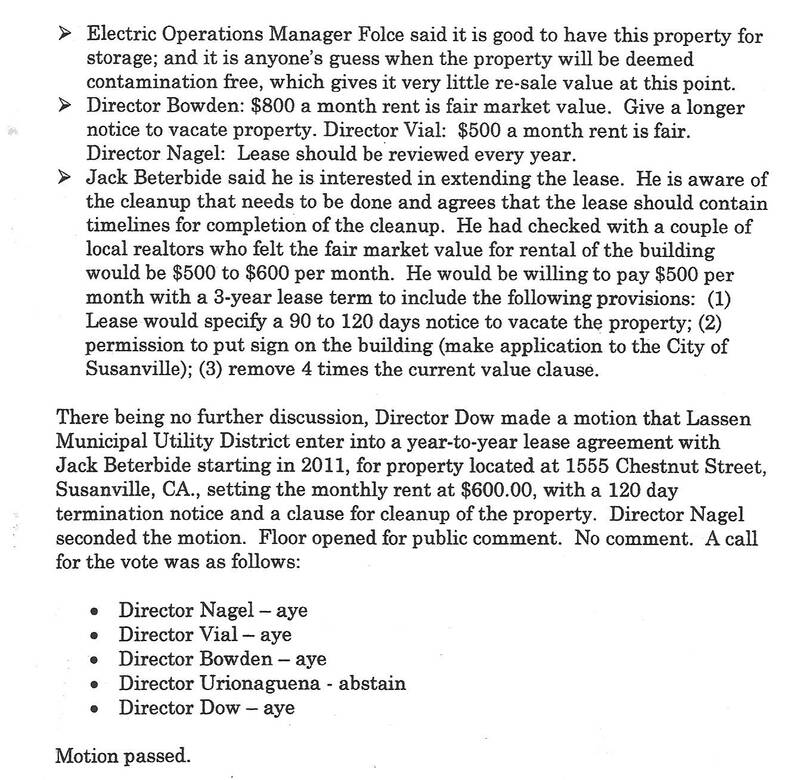 The closed session description was negotiations with Jack Beterbide for parcels 101-150-23 and 101-150-02. However, Jack Beterbide did not own one of the parcels (101-150-23). 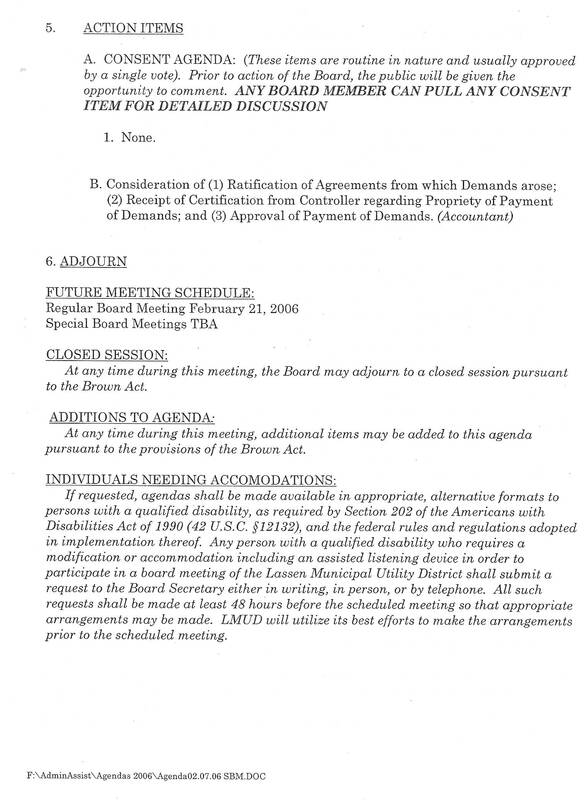 The Brown Act requires the Board to report any actions taken in closed session. The LMUD board took "no reportable action". KWH objects to this issue being discussed in closed session and reminds the Board that this must first be placed in open session. 54956.8- Negotiations for sale/purchase of public property. 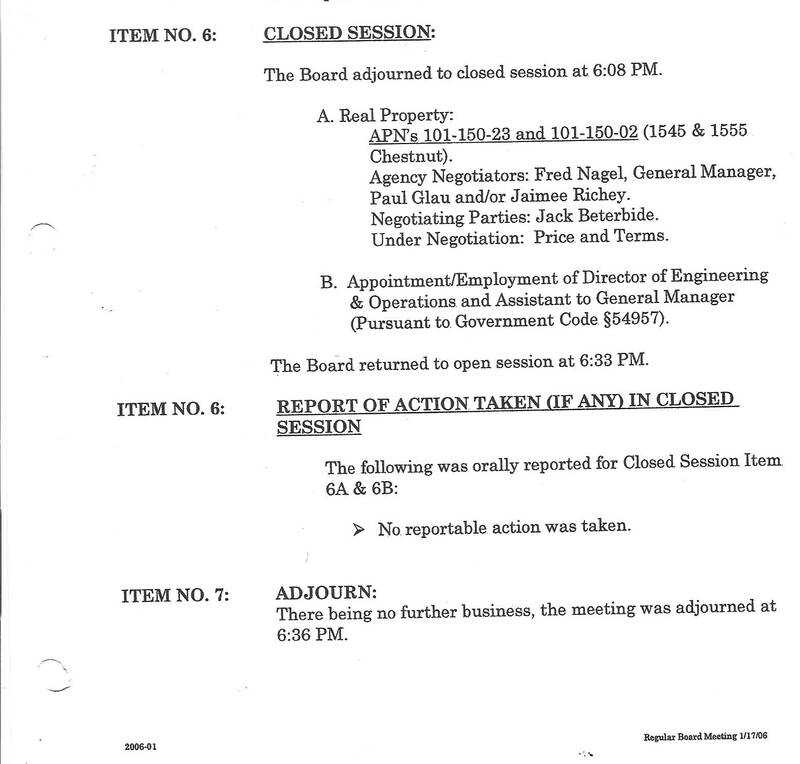 At the November 22, 2005 LMUD meeting, the LMUD Board and Frank Cady again placed the "real property" issue into closed session. Fred Nagel (a PSREC utility customer) , is the lead negotiator for the LMUD Board. Beterbide is Fred Nagels close friend. Again, "no reportable action" is taken by the Board. NOTE: Jack Beterbide does not even own one of the parcels that he is negotiating with LMUD for (APN 101-150-23, is owned by Robert and Gail Prosise). KWH begins inquiries on the purpose of these real property negotiations and the possibility of hazardous waste and contamination existing on all three properties. . The "real property" deal is not placed on this agenda. Frank Cady orders an appraisal of 65 S. Roop Street (LMUD office), APN 101-150-02 and 101-150-023. The real property deal is placed again on the agenda, in closed session. Paul Glau, LMUD's Hazardous Waste Manager, is now involved with the "real property" negotiations. 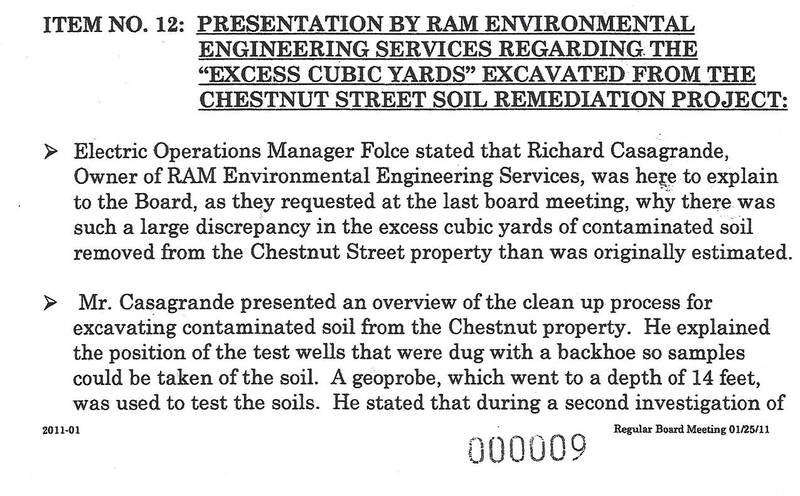 There were public concerns that LMUD had dumped huge amounts of hazardous waste on their property on Chestnut Street. LMUD again reports "no reportable action taken"
The "real property" deal is placed again on the agenda, in closed session. The LMUD Board reports "no reportable action was taken". LMUD has never placed the purchase of the "real property" on any agenda other than in closed session. The Brown Act requires this issue to be placed on the agenda in open session. 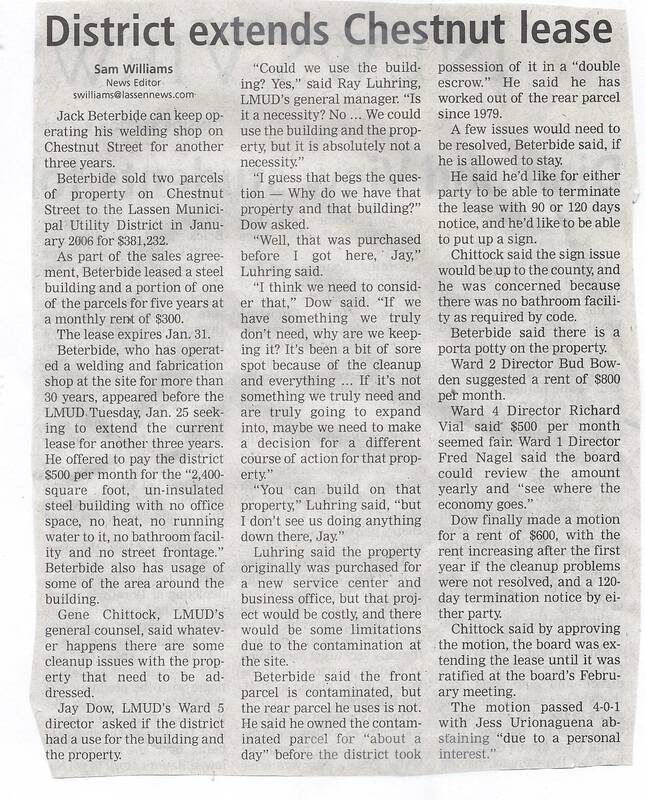 To date: the LMUD Board has never taken any action to purchase parcel 101-150-023 owned by Robert and Gail Prosise and parcel 101-150-02 owned by Jack Beterbide. Frank Cady makes a purchase of property illegally. 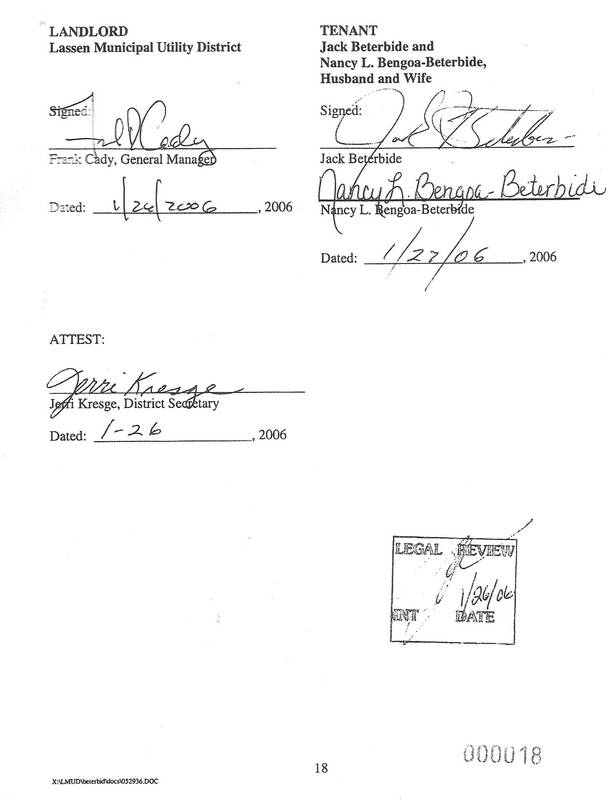 Frank Cady purchased property from Jack Beterbide without Board approval. 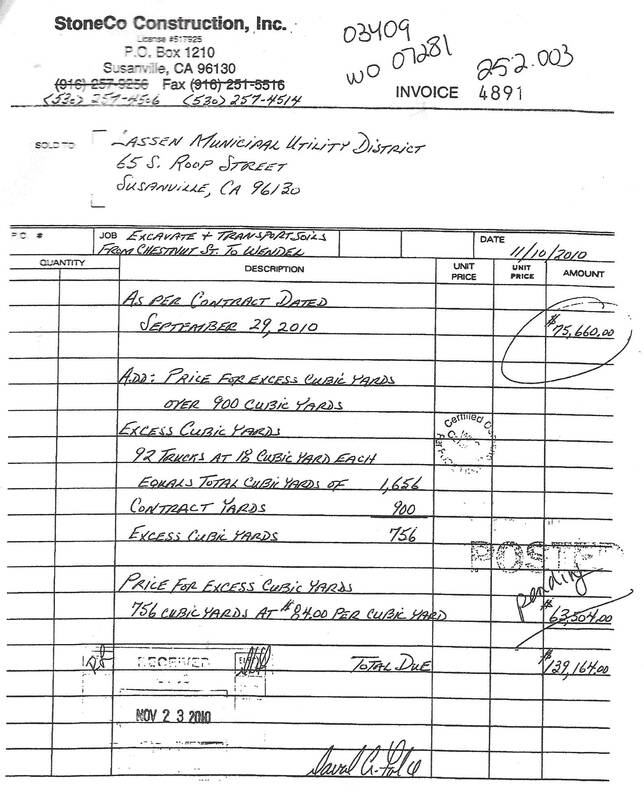 Frank Cady has a limit to purchase supplies and materials up to $25,000. Anything above this must be placed on the agenda for an open session public discussion and disclosure. LMUD must hold an open session in which it must identify the property to be purchased. LMUD has never put this issue in an open session. LMUD is in violation of the Brown Act. 54956.8- Negotiations for sale of public property. 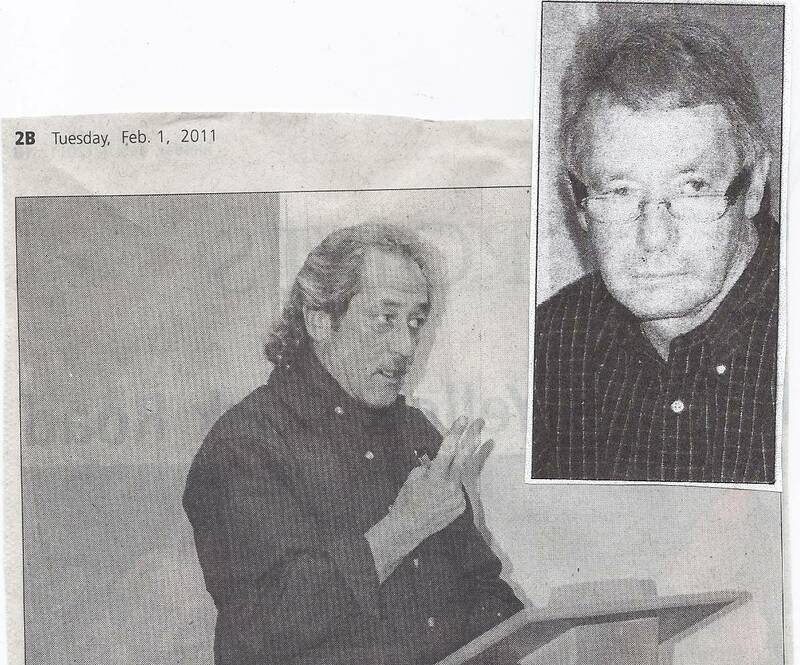 On February 1, 2006....... Jack Beterbide suddenly purchases parcel 101-150-23 (.92 acres @ $130,434.00 per acre) from Robert and Gail Prosise for $120,000 AND SELLS IT TO LMUD THE SAME DAY . On February 1, 2006,...... Frank Cady records the purchase of parcel 101-150-023 and 101-150-02 from Jack Beterbide for $381,232 (check #14603 1/30/06). The purchase was signed by Frank Cady on January 26, 2006. 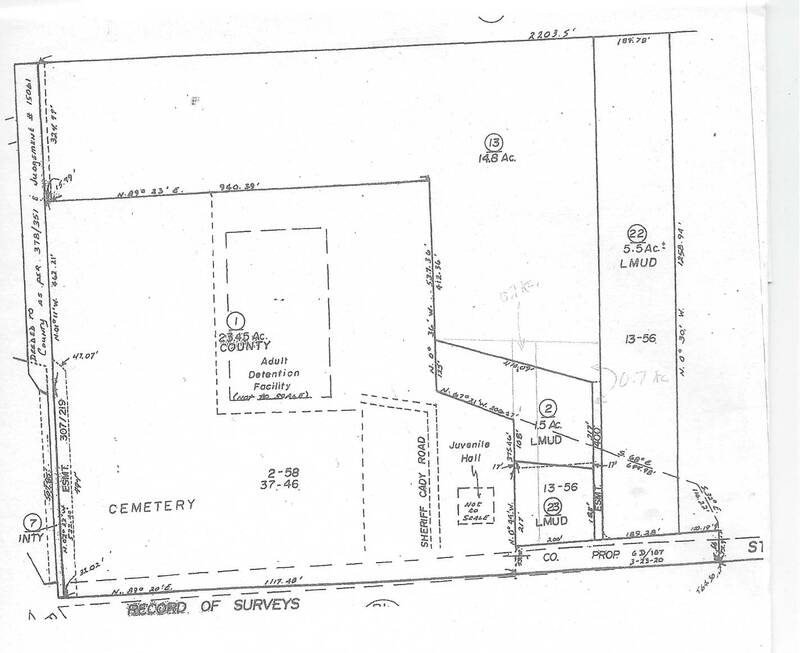 Jack Beterbide sold the two parcels to LMUD, (2.42 Acres), for $157,438 per acre. LMUD could have purchased the "Prosise's property directly.....for $120,000 or less. 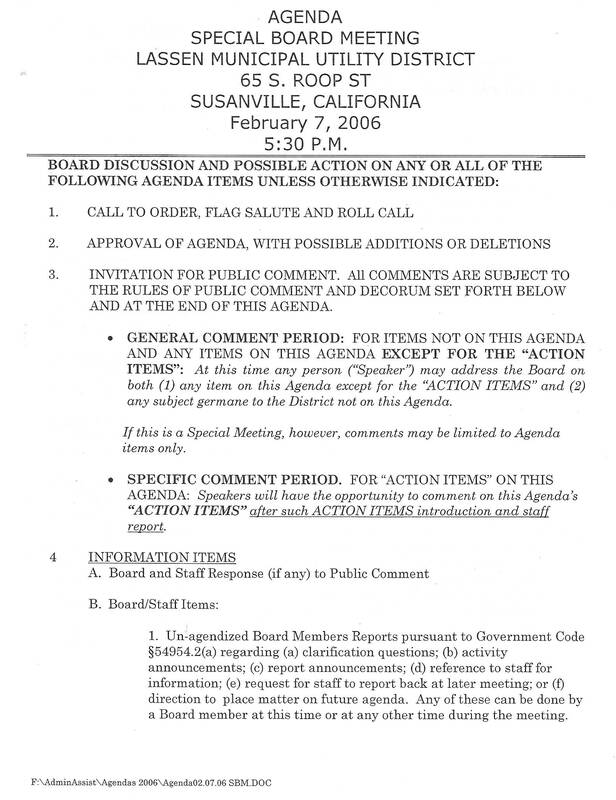 The LMUD Board cannot violate their governing law or the Brown Act. Cady cites LMUD Resolution 99-02, however the LMUD Board must comply with the law and cannot pass any resolution or ordinance that violates current laws.